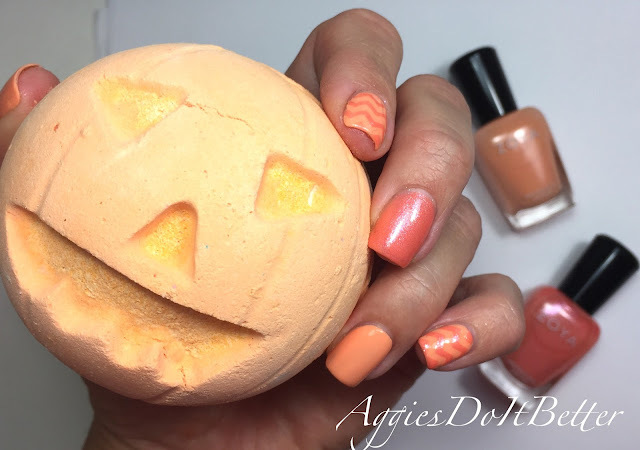 Aggies Do It Better: Lush Halloween collection 2016: Pumpkin bath bomb plus coordinating mani with Zoya! 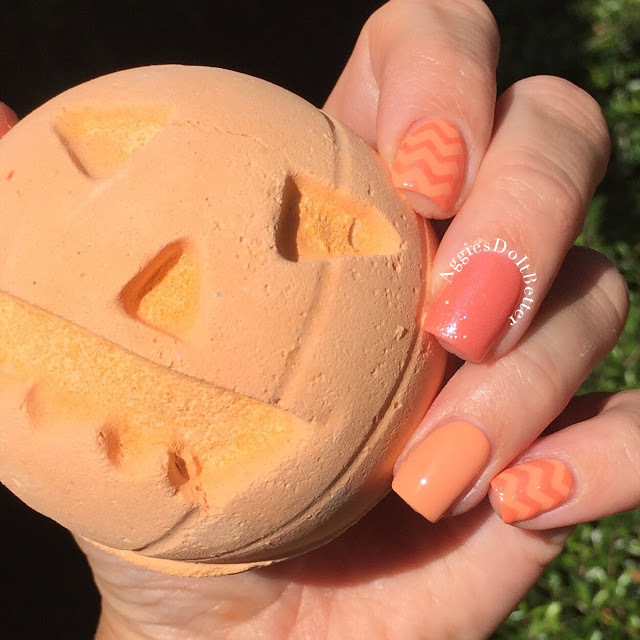 Lush Halloween collection 2016: Pumpkin bath bomb plus coordinating mani with Zoya! Hey guys! Today I have the Pumpkin bath bomb from Lush! This is part of the limited edition Halloween range, and I have several of them coming up here in the next couple weeks for you! For the matching mani....whoo boy. I had some trouble! My hands are so shaky lately when I'm concentrating on nail art. I practiced drawing triangles first on paper then tried on my nails several times. It just did not look good! I got so frustrated I gave up and just went with a matching-ish mani. The base crème is Zoya Cole and the shimmer is Zoya Zahara. I did just order a little beginner set of stamping stuff from Pueen on Amazon, I can not wait for it to get here. I tried to resist stamping for so long and I think my hand drawing days are over! 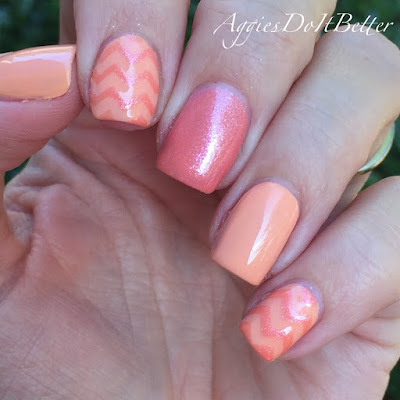 For the chevrons/zig zags I just used some nail vinyls. At least I can't mess those up. I'm mostly happy with how they turned out. Here's another look at the mani in the shade. Excuse my dry fingers...this is about as good as they look right now with constant oiling. Screw you, oncoming winter! 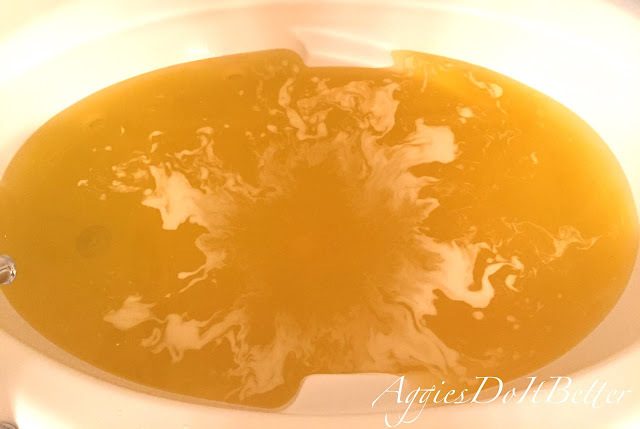 Here's a video of Pumpkin bath bomb in action. It is kind of boring, it sunk to the bottom and just sat there and fizzed. I guess that's ok! Not all of them have to be exciting! It makes up for it in cuteness :) And best of all.....NO GLITTER! Here is my thoughts on this bath bomb. It smells good, REALLY good. It's everything you want it to smell like...very spicy and fall-ish. Officially it has pimento berry oil (no idea what that is), vanilla, cinnamon and limonene (yay). I will say, it still kept its scent while it was dissolving until the very end. The last bit of scent was totally different, almost musky? Maybe that's the pimento? I don't know, but it changed the overall scent profile for me. I didn't really enjoy it! It also makes the bath water a vivid orange....ya'll know how I feel about that. It's my least favorite color so if I'm going to sit in orange water for a long period of time it needs to be extra-awesome. I believe this is new this year to the Lush Halloween range. Pumpkin bath bomb will not be a repurchase for me, but I don't regret buying it. It's super cute, and look at the cool starburst it makes in the tub from the sinking and dissolving!